Little Mrs. Married: I'm famous, y'all! See there? Melissa, and the start of my last name, under the picture, in the far right corner??? Okay, maybe you don't. I don't have the actual paper. This is a screenshot of Shane's instagram. If you click the picture to see it larger and then squint a whole whole lot, you can maybe IMAGINE that it says "photo provided by..." & then my name! The start of it, anyway. The whole thing is actually there but i don't have a copy of the article! 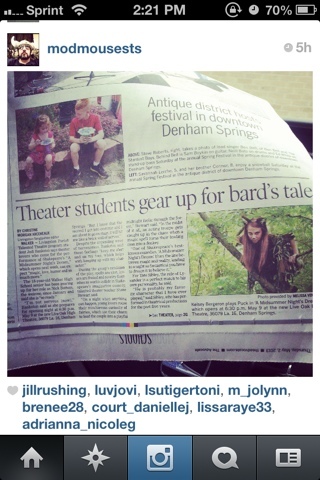 And apparently theater news is not important enough to go on the app version of our paper!? How rude! Still, I'm excited. Even if you can't fully see it! The article is here and if you click through the pictures, one of the captions says the photos are provided by me! I've never had my name in the paper. Oh, that's not true. SOMETIMES they mention the stage manager for a show, in theater articles. It's kind of rare, actually (in my experience, anyway). But that's okay. That's not why i do theater! I love photography, and would want to do it even if i never got a picture in the paper. But man! It does feel pretty good to see my picture with my name there! Yay! I didn't post some of these before now, because I just didn't feel like it was my best shoot. I was a little out of practice, and forgetting simple things like, GET YOUR PEOPLE OUT OF THE DIRECT SUNLIGHT!!! And SET YOUR SHUTTER SPEED FIRST! But it was hot, it was in the freaking WOODS, and it's a miracle I didn't slide down a hill in the mud, or trip over the giant roots from some of the trees out there, or get poison ivy! All that being said, perhaps i should share some of the pics! The pics were of my husband's cousin's cast of Midsummer Night's Dream. He is the theater teacher at a local high school.